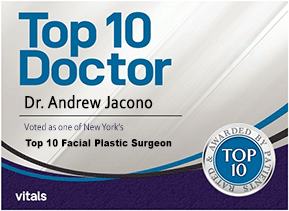 Dr. Andrew Jacono, founder of the New York Center for Facial Plastic and Laser Surgery, and Section Head of Facial Plastic and Reconstructive Surgery at North Shore University Hospital, is frequently consulted by his colleagues for his expertise in revising and correcting bad plastic surgery results. As an expert in facial cosmetic and reconstructive surgery, he is known to take facial plastic surgery mistakes and turn them into success stories. The most common facial surgery complications relate to either bad eyelid surgery, bad rhinoplasty or bad face lift surgery. 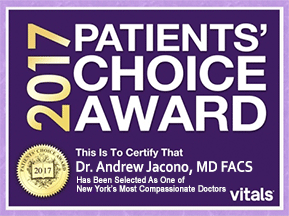 Dr. Jacono was featured on The Mike and Juliet Show and Fox 5 News with his patients who required revision surgery to correct the results of poor plastic surgery performed by another surgeon. The patients featured required revision rhinoplasty and revision eyelid and midface lift surgery. There are some measures you can take to minimize your risk of having a poor primary surgery. Your surgeon should be Board Certified by the American Board of Facial Plastic and Reconstructive Surgeons (http://www.abfprs.org/). It is important to find out what procedures your doctor specializes in, how many he or she has performed and how recently, and research his or her track record with the state medical board. Try to get a referral to a cosmetic surgeon from a doctor or a friend who has had a procedure similar to one you are considering. Look at before and after photos to see examples of his or her results. Plan to be in your best physical health before having surgery, and agree to follow pre- and post-operative instructions, which are designed to optimize your result. 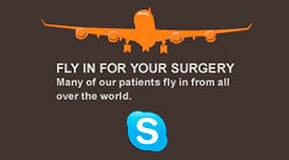 Discuss with your surgeon the anticipated and realistic results. Finally, evaluate your surgeon for the three A’s: affability, approachability, and availability. This will give you an idea of how your surgeon will handle any complications in the unlikely event that one does occur.